Traditional Ukrainian Golubtsi are made healthier as a blend of quiona, couscous, barley and oatmeal are substituted for some of the rice called for, creating the same traditional delicious taste only leaner. My mother makes amazing golubtsi and to sub some grains for the other cup of rice is a brilliant idea for those of you who want to get those extra valuable nutrients in your meal. You probably won’t even detect any grains in these rolls, but their certainly in there. Feel free to change up the meats or grains and enjoy these cabbage rolls with a big dollop of sour cream! 1. Rinse the rice; drain and place into a medium sized saucepan. Add the other grains and pour in 2 1/2 cups of water. Bring to a boil and reduce heat to low. Simmer grains for 10 min, then remove from heat and set aside. 2. Dice onions and and grate the carrot. 4. Add the diced tomatoes, minced garlic and heavy cream; bring to a simmer for about 5 min: remove and cool before adding to the meat mixture. 5. In a large bowl season the meats with the salt, pepper & garlic powder. Set aside. 6. Remove the cores off the cabbage heads. Place a cabbage head into a pot of boiling water, core facing downwards. Keep in the water for 5 minutes, then slowly remove the cabbage leaves one at a time, allowing leaves to float in the water for a few minutes. Remove and place onto a tray. Repeat with the other head of cabbage. 7. 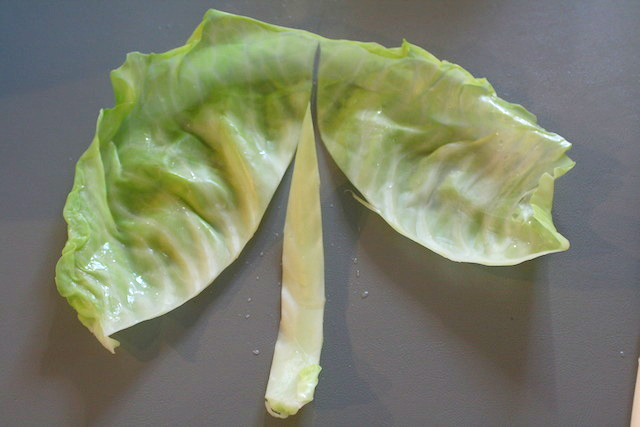 To roll cabbage leaves; remove the stem off the super big leaves and just slice off the thicker part of the stem on the smaller leaves. 8. Once the rice and sauté have cooled add to the meat mixture and mix well. 9. Spoon the beef mixture into each cabbage leaf and roll, folding in the sides to seal the roll. 10. Place rolls into a cast iron pot. Stack and drizzle each layer with ketchup, a handful of onions and a few slices of butter. 11. Stir together the water, lemon juice, sugar and salt and pour over the stack of rolls. Bake in a pre-heated 400 degree oven for 1 hour then reduce temperature to 350 degrees F and bake for an additional hour. Rinse the rice; drain and place into a medium sized saucepan. Add the other grains and pour in 2 1/2 cups of water. Bring to a boil and reduce heat to low. Simmer grains for 10 min, then remove from heat and set aside. Dice onions and and grate the carrot. Add the diced tomatoes, minced garlic and heavy cream; bring to a simmer for about 5 min: remove and cool before adding to the meat mixture. In a large bowl season the meats with the salt, pepper & garlic powder. Set aside. Remove the cores off the cabbage heads. 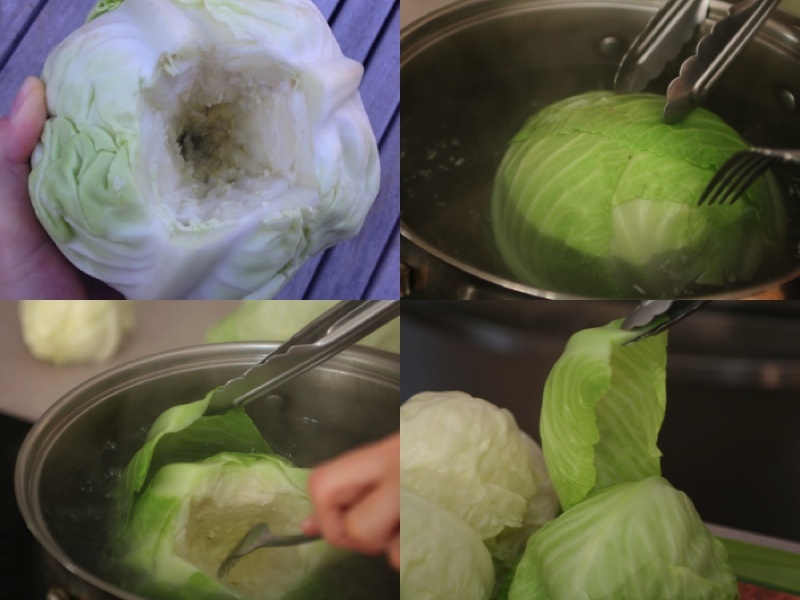 Place a cabbage head into a pot of boiling water, core facing downwards. Keep in the water for 5 minutes, then slowly remove the cabbage leaves one at a time, allowing leaves to float in the water for a few minutes. Remove and place onto a tray. Repeat with the other head of cabbage. 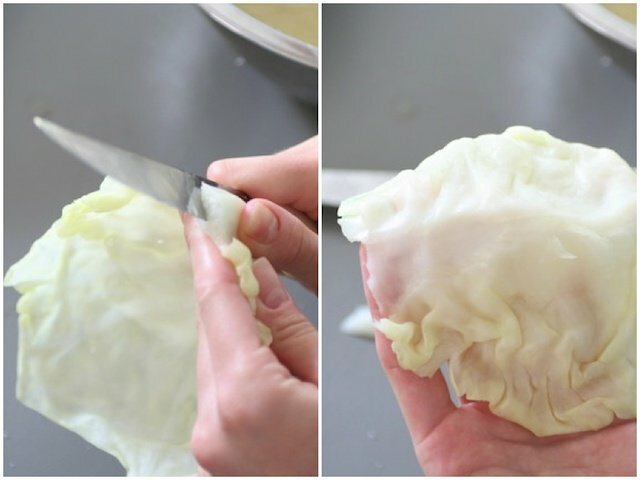 TO ROLL CABBAGE LEAVES; remove the stem off the super big leaves and just slice off the thicker part of the stem on the smaller leaves. Once the rice and sauté have cooled add to the meat mixture and mix well. 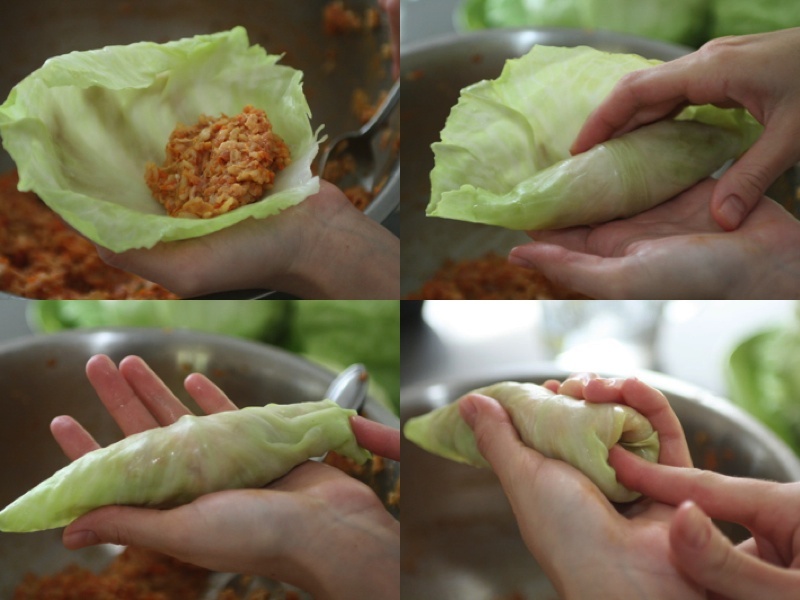 Spoon the beef mixture into each cabbage leaf and roll, folding in the sides to seal the roll. TO ASSEMBLE ROLLS: Place rolls into a cast iron pot. Stack and drizzle each layer with ketchup, a handful of onions and a few slices of butter. Stir together the water, lemon juice, sugar and salt and pour over the stack of rolls. Bake in a pre-heated 400 degree oven for 1 hour then reduce temperature to 350 degrees F and bake for an additional hour.